To celebrate the [tag]summer solstice[/tag], I made sunny yellow cornmeal “[tag]mush[/tag]” with [tag]blackstrap[/tag] [tag]molasses[/tag] for [tag]breakfast[/tag] this morning. We are enjoying an overwhelmingly beautiful bright sunny yet not-to-hot day here in central [tag]Massachusetts[/tag]. The [tag]garden[/tag] is soaking up the sun and growing with leaps and bounds, our moods are sunny, and all is right with the world. The only downside to the solstice is that we are now on the other side of curve and the day length will begin to decrease every day until the winter [tag]solstice[/tag]. Mush is something my mom used to make for us as kids. It is real down-home [tag]comfort[/tag] [tag]food[/tag] and it is an excellent way to use excess [tag]grits[/tag] or [tag]polenta[/tag] (which are the same thing). I love and adore blackstrap molasses so I use this on mush and [tag]pancake[/tag]s.
Line the bread loaf pan with foil and spray with cooking spray. Make your grits or polenta and pour into the lined loaf pan. Cover with extra foil. Allow to cool overnight (or until cold). Slice and then pan fry until golden brown and warn throughout. 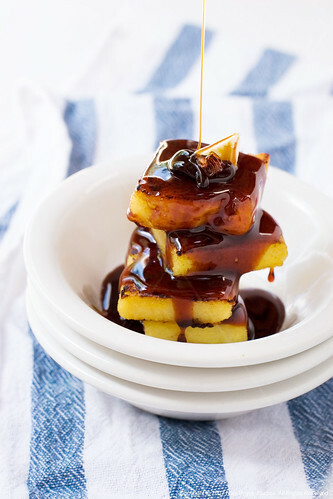 Serve with butter and molasses/syrup. These recipe looks great,and the colors….are the summer colors..Divine.My firts visit ,but I certanly come back. Sylvia: so glad you like them! Welcome and please come on back and check in when you have time. Hillary: thanks! This is so delicious, if you can, do give it a try. I am glad you are a new reader! let me know if you try the recipe. 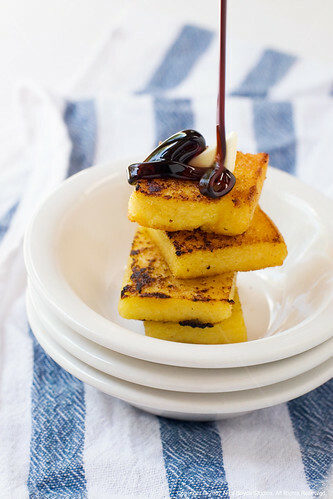 Wow, I never would have picked that polenta and molasses go well together. Looks delicious. And anything with a slow drip of molasses over it has my vote, stunning photos.